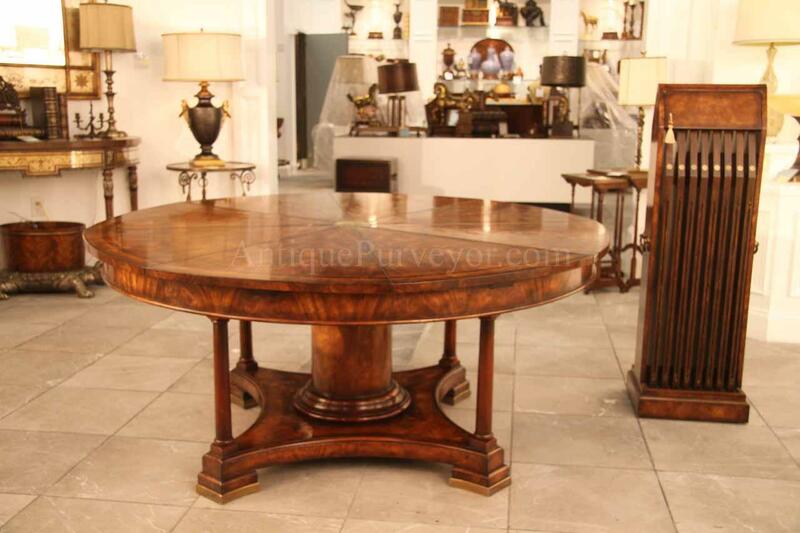 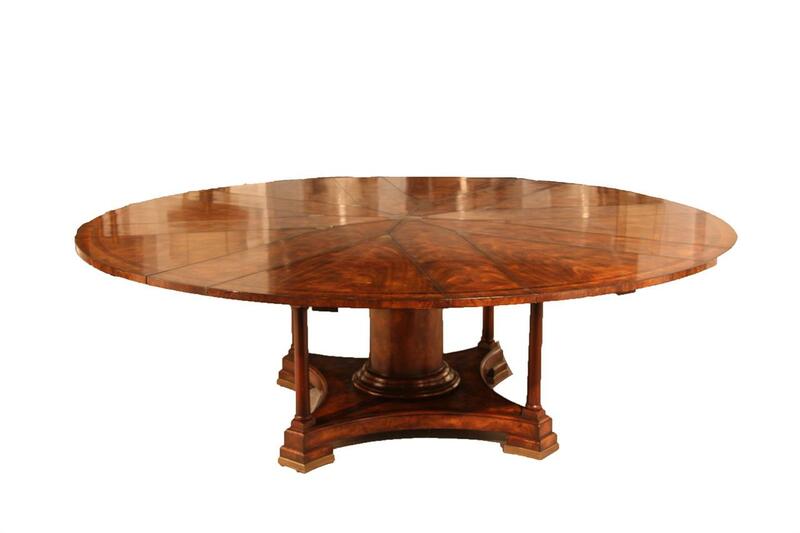 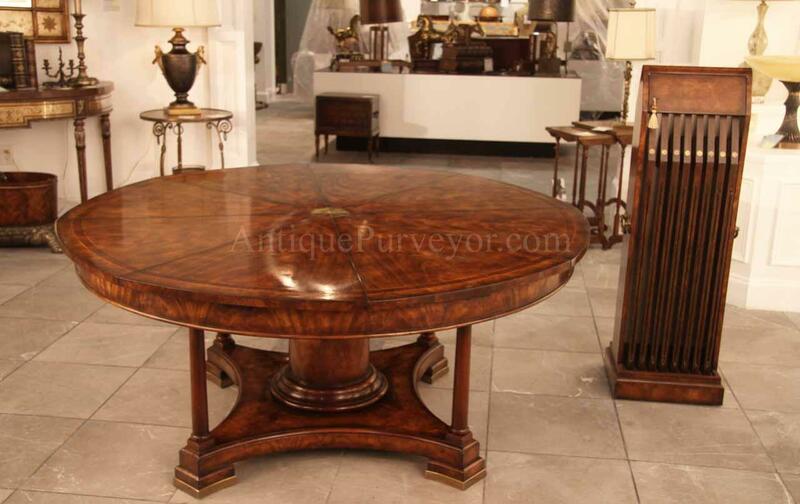 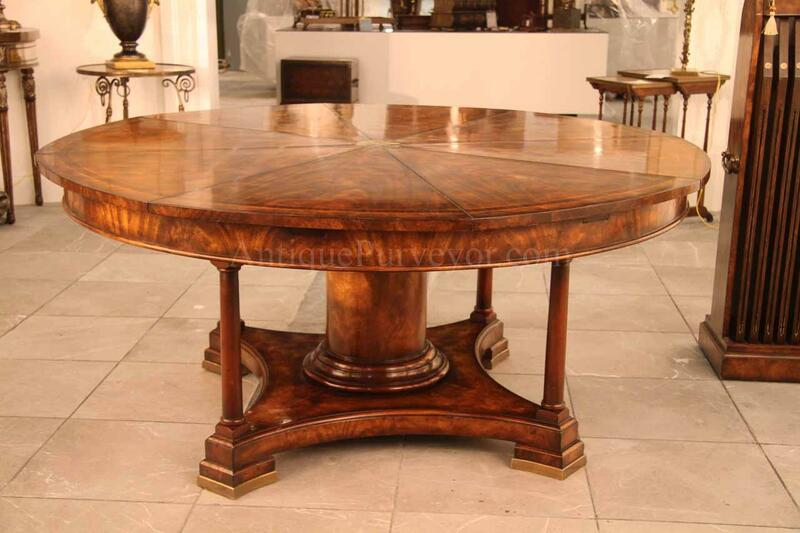 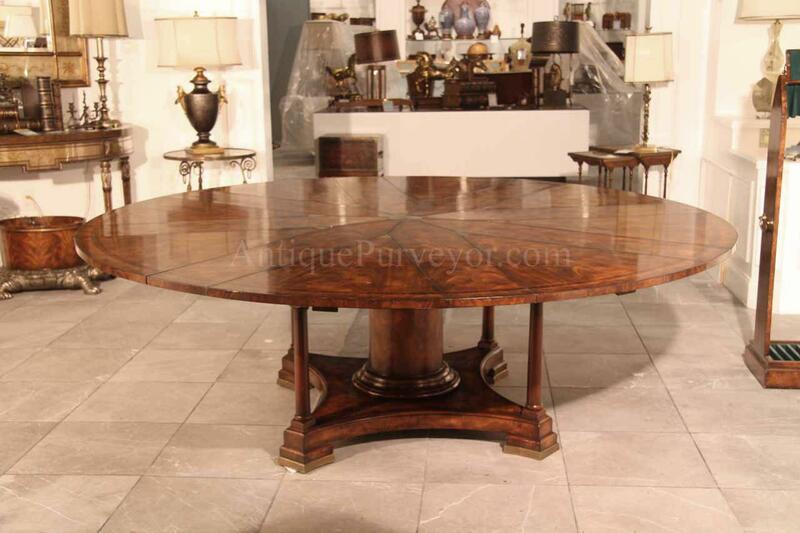 Description: Magnificant and brilliantly designed 18th century round mahogany reproduction dining table expands 60 to 84 inches and seats 8 to 10 people. 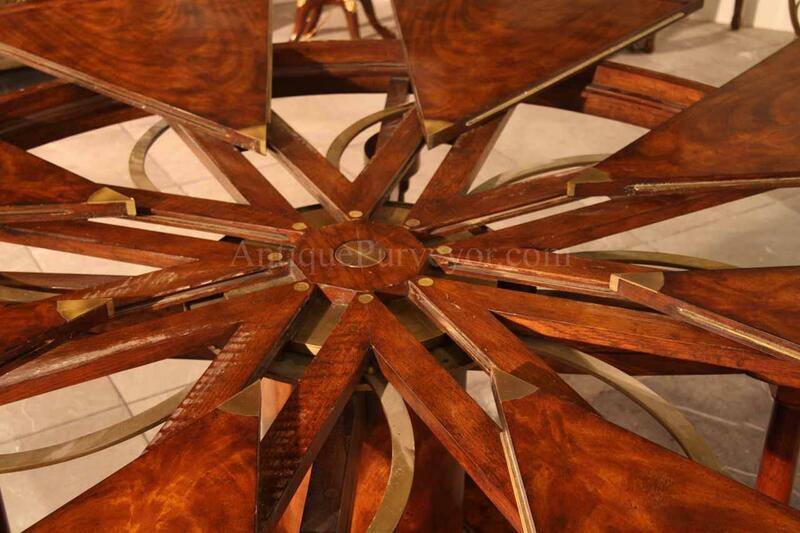 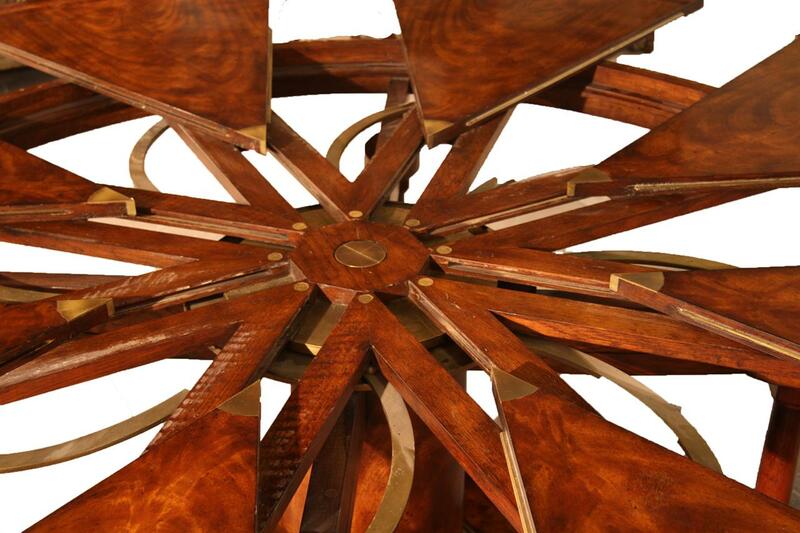 This style table is also known as a radial table. 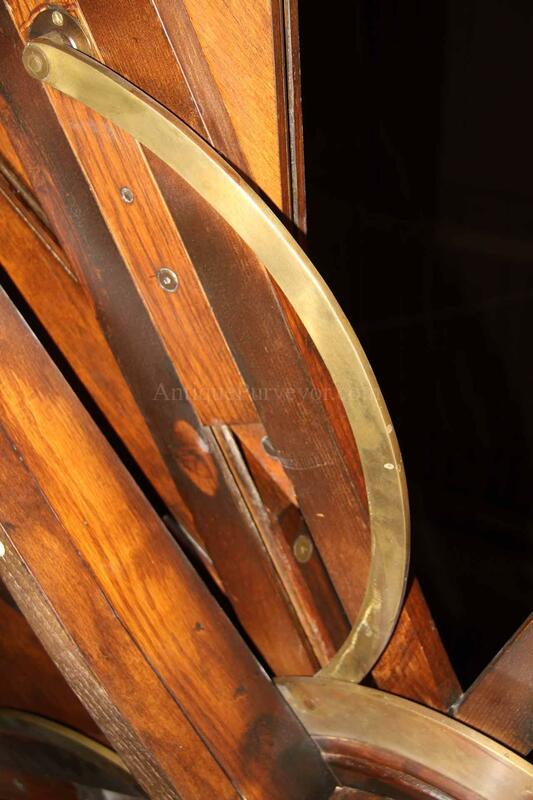 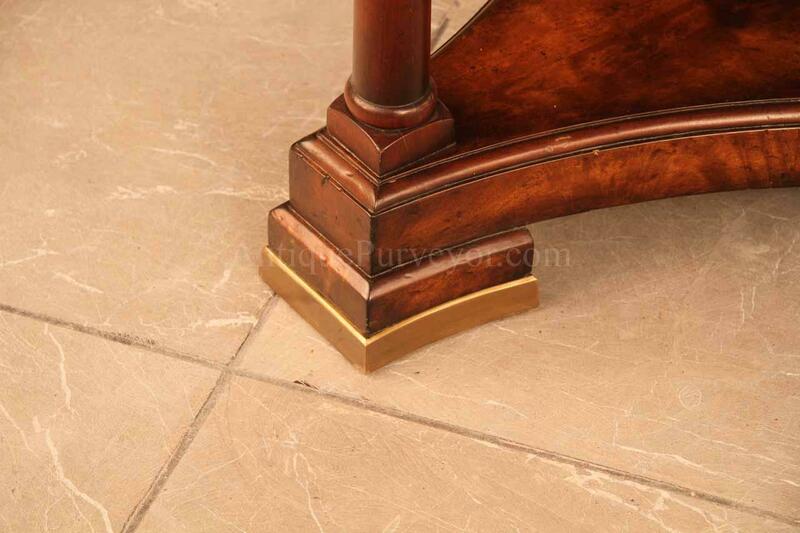 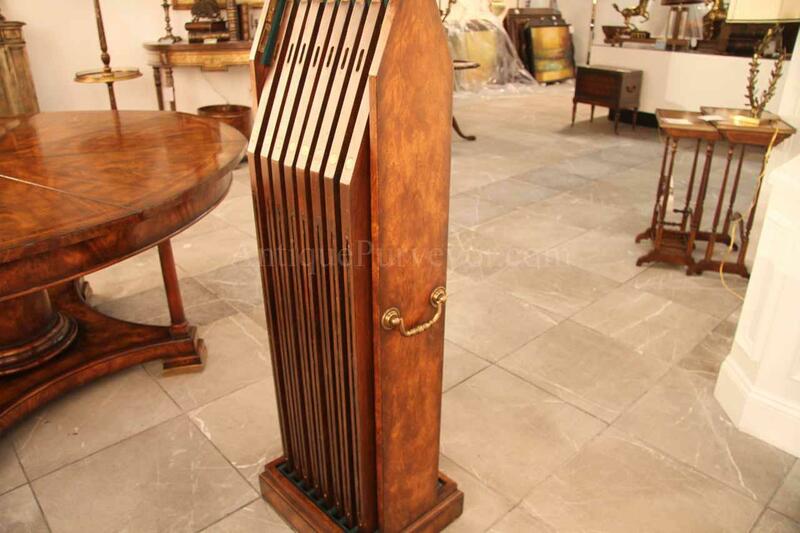 It features brass hardware and a heavy turned column style base. 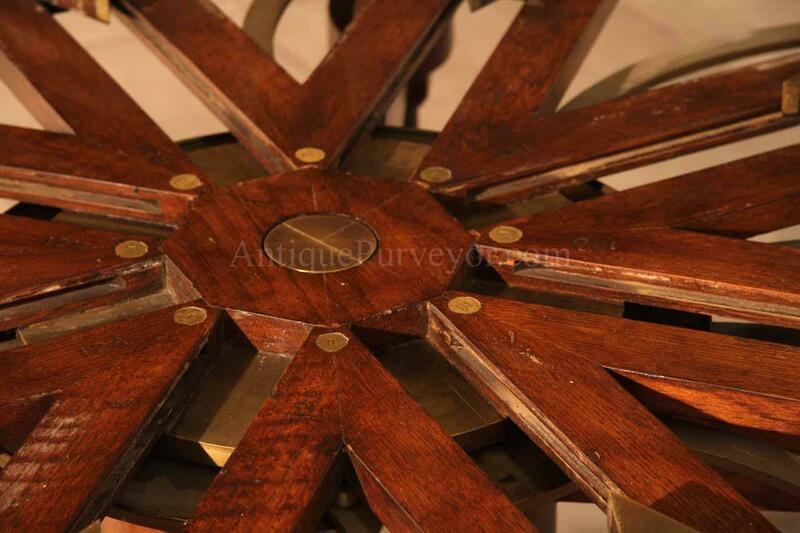 This is a very sturdy table. 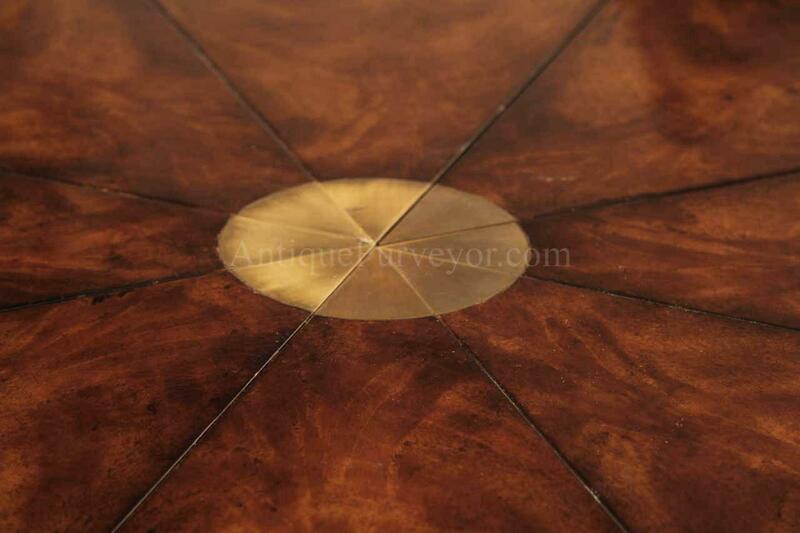 The leaves come with a locking storage box. 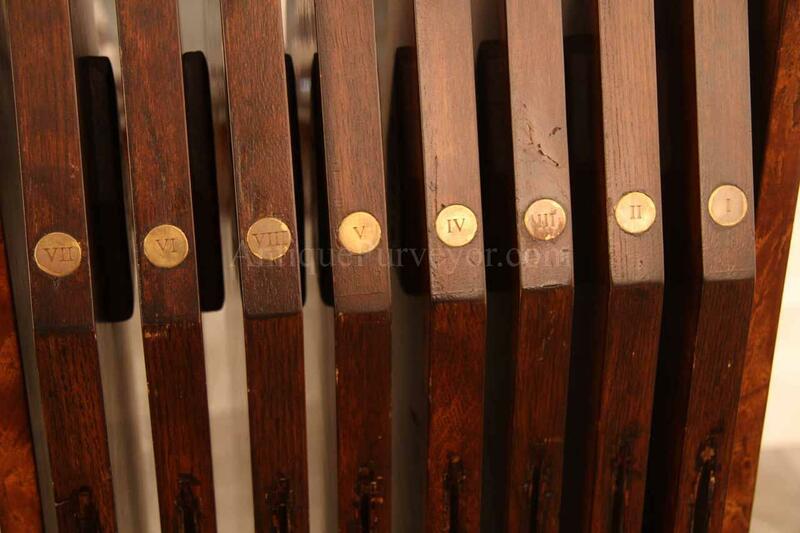 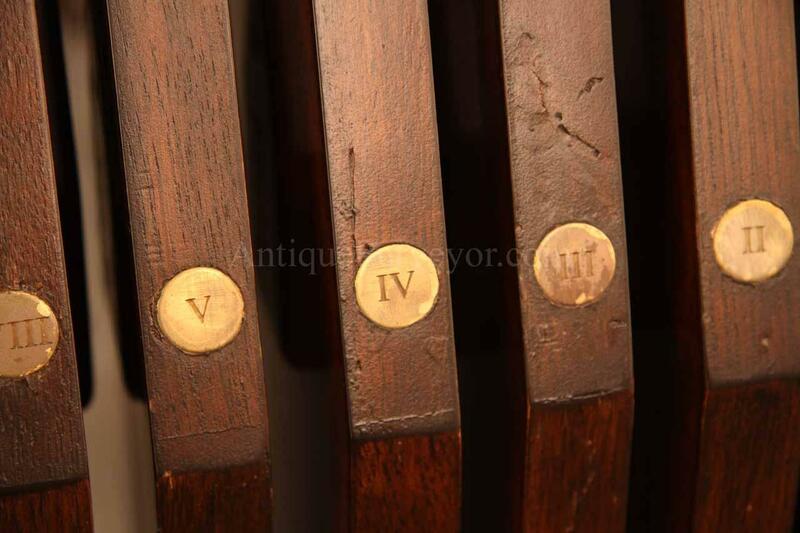 Each leaf is numbered 1-8 with roman style characters on a brass plate. 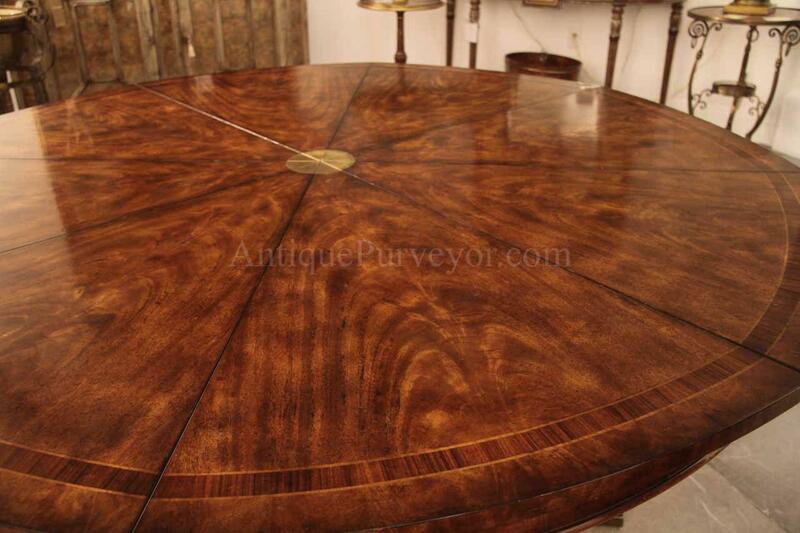 Opening and closing this table is very easy. 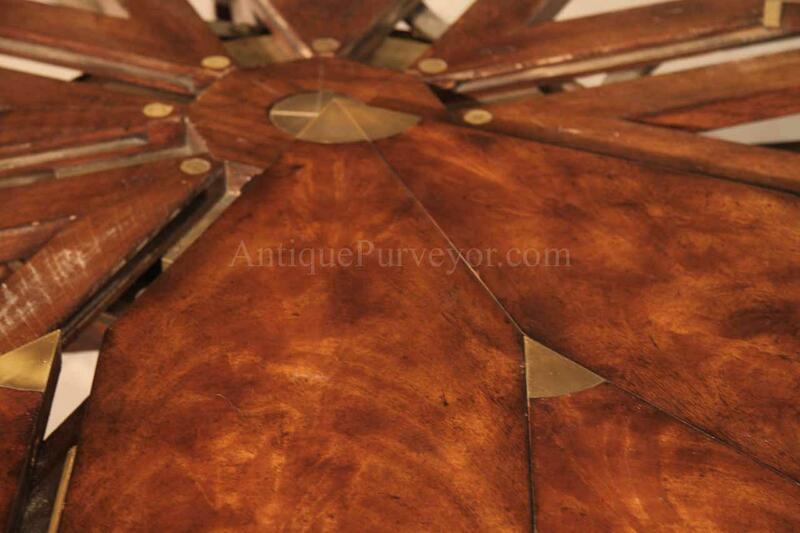 The table extends outward while you turn it clockwise and it becomes smaller when you turn it counter clockwise. 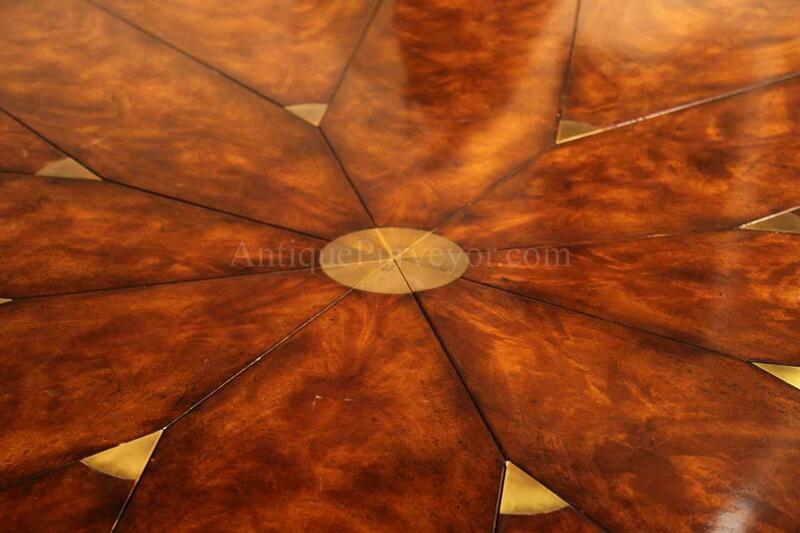 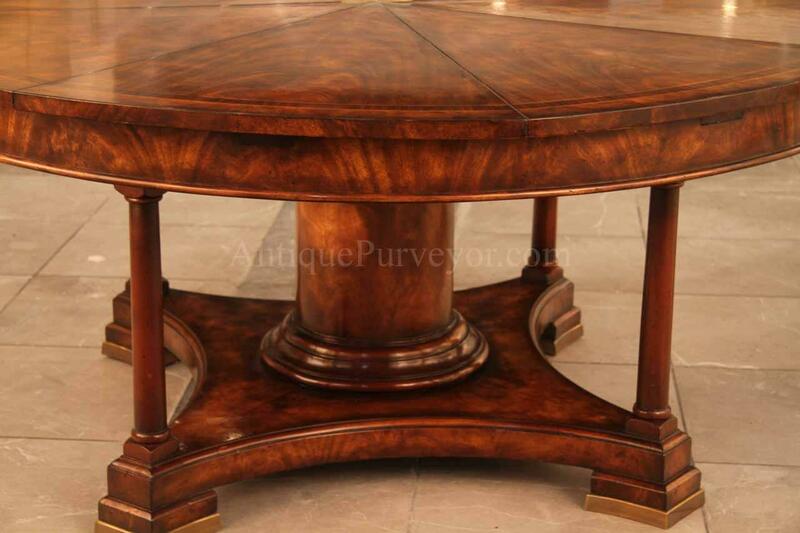 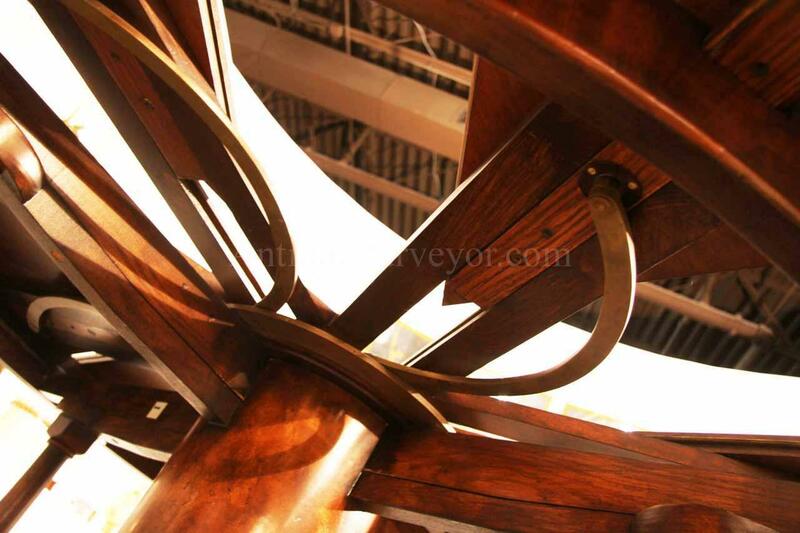 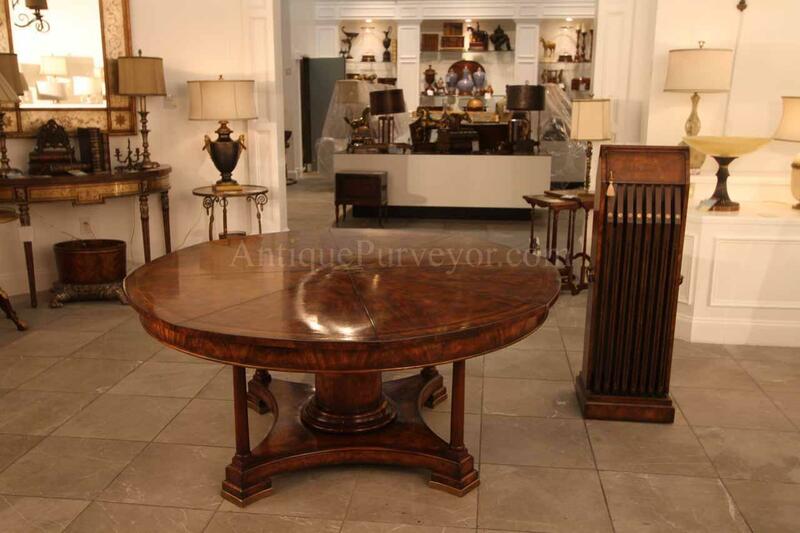 The table is made from mahogany solids and fancier swirl and crotch mahogany Veneers. 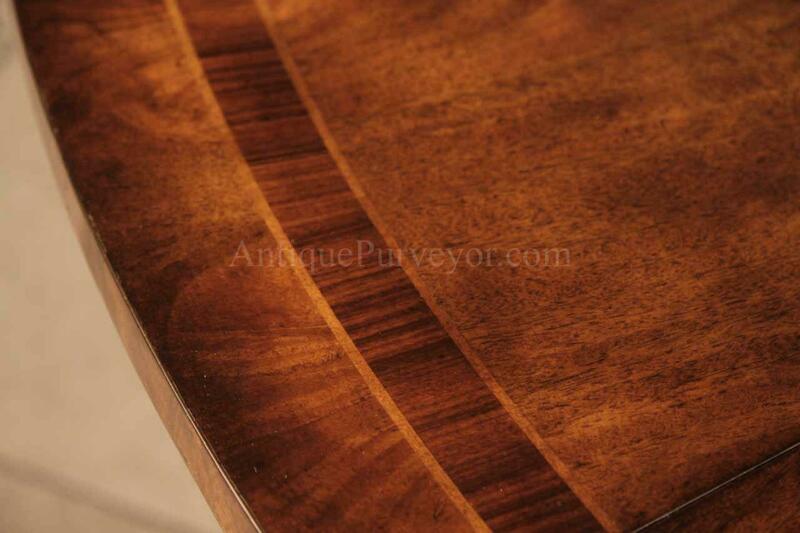 Top is banded with a rosewood inlay and fine satinwood pinstripes. 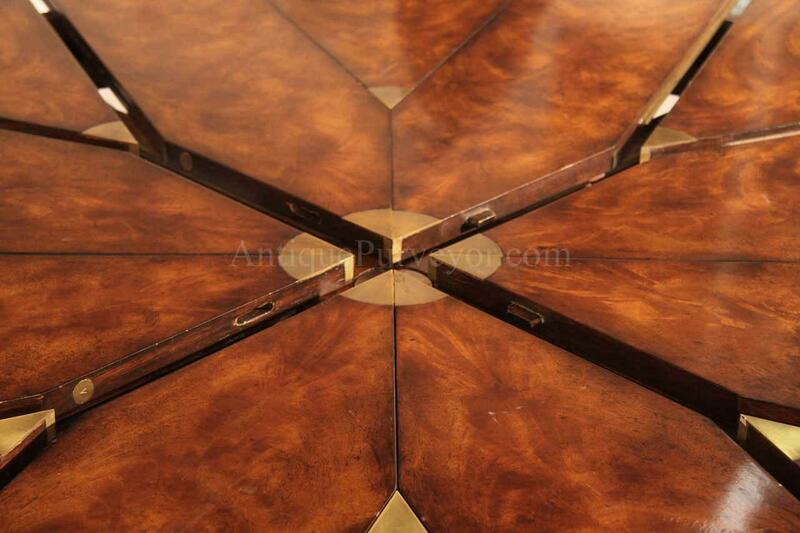 This table was cafefully designed. 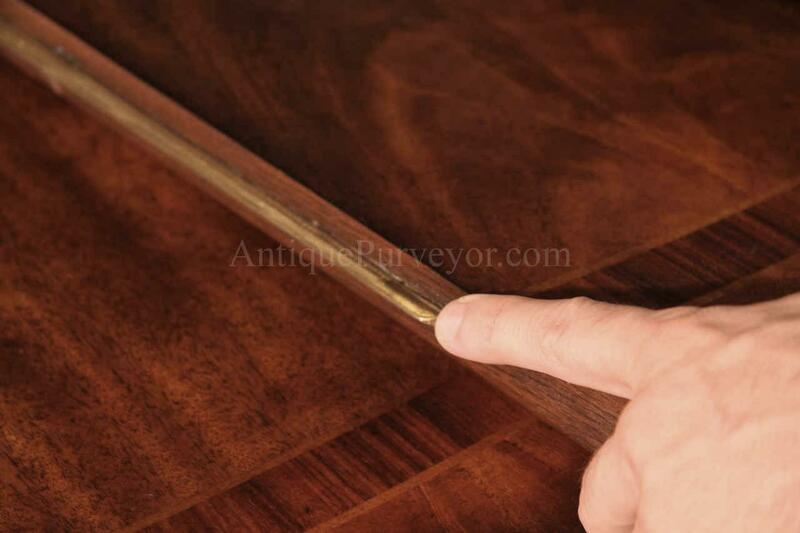 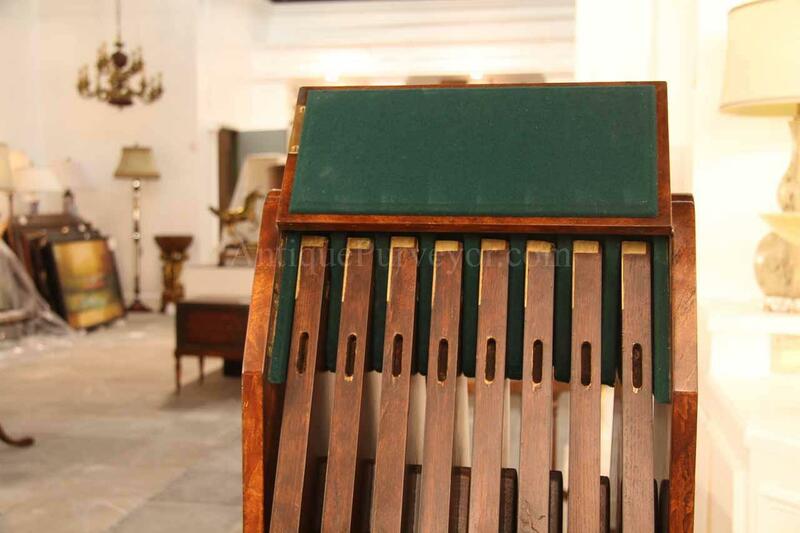 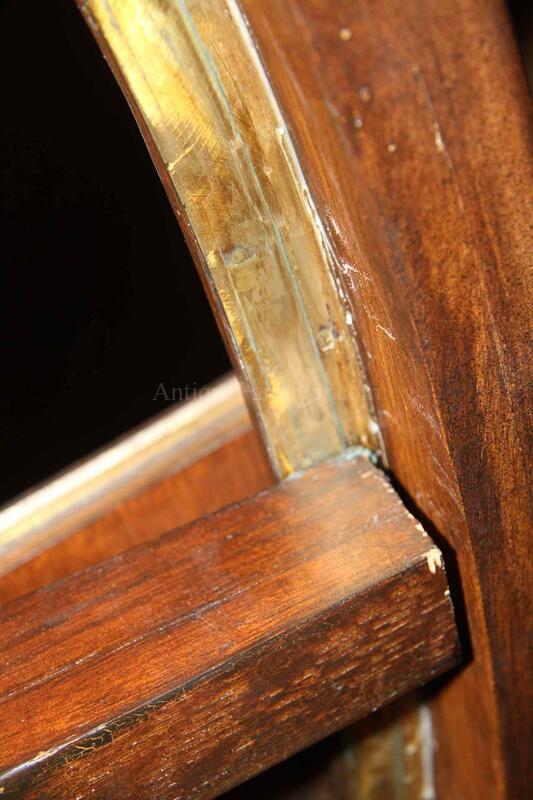 Most of the moving parts and areas of the table which are most sensitive to being worn over time have been forged from bass to resist wear and tear from ordinary usage. 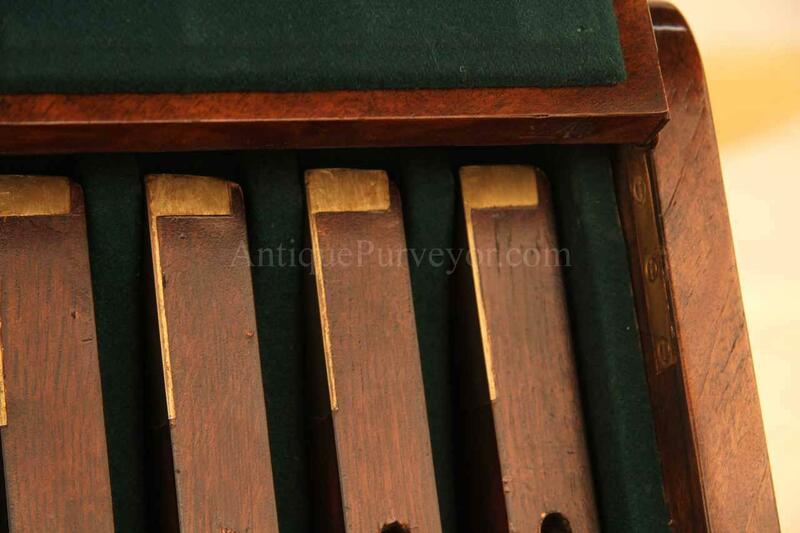 We show most of these brass parts in pictures and captions within this ad. 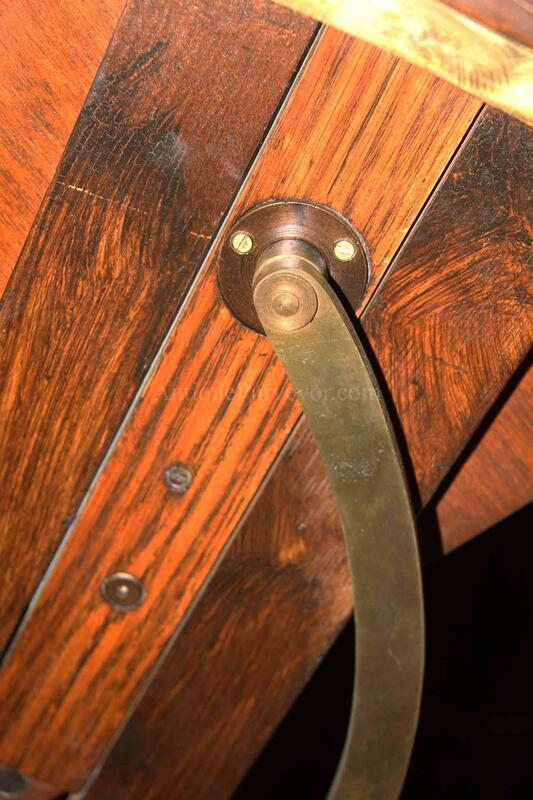 Feet are capped with brass hardware as well. 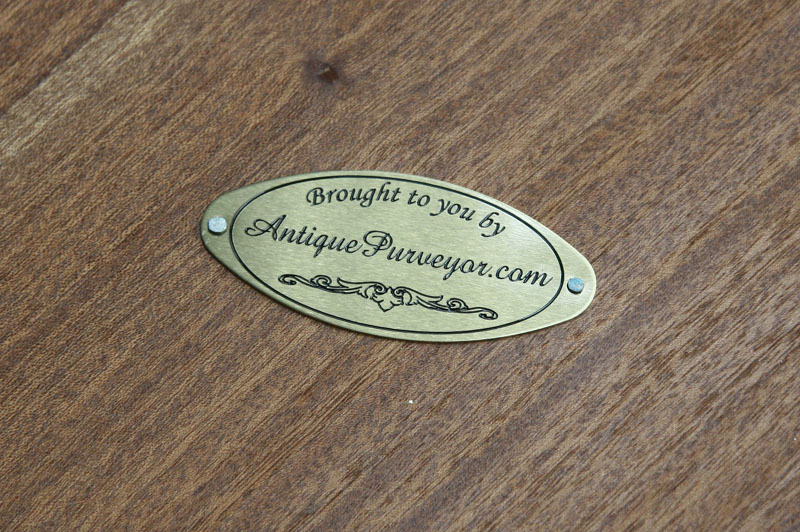 Condition: new, will not have original box, opened and inspected at studio before shipping, minor builder imperfections,no damage.